Planted 24 cauli All the Year Round and 24 Snowball A. And I can see a leek growing down inside a hole! Leeks being a bit shy - seem to be growing roots backwards out of the seeds. Odd. Two beans up, and a third looking like it might be on the way, given the bump in the compost! Bit of a busy day. Dragged P up to the allotment first thing, armed with a sledgehammer and some metposts. He managed to demolish a few onions but missed the garlic, fortunately, and then we went and bought the posts. Attached vine eyes at RHS recommended heights and pottered back alone, only to get utterly drenched as the heavens opened as I was walloping the posts into the supports. The Italian chap must have felt sorry for me whacking them with a hammer as a tiny sledgehammer appeared. Bless. Still took some doing! Ended up standing on a chair prevented from sinking into the nicely dug ground by an ancient bucket. And pruning the Bramley whenever it poked me. Just about had enough wire to string up two of the vine eyes, and so went for the raspberry canes, while putting back the hammer. Managed to knock off and bend my specs by not noticing a piece of wood in my way. *sigh*. Gave up and went home in the downpour to repair them. Had lunch and by then it was typically blue sky. 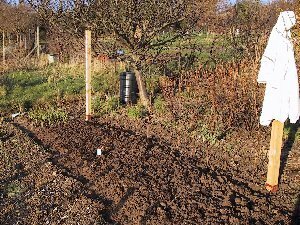 Went back for another attempt, and this time succeeded in getting all the canes into a trench of manure and tied in to the wires. The lack of the highest wire wasn't a problem as none of the canes reached it. I assume in later years they will. There were several basal buds which looked like new canes, and there was a Baker's Dozen canes. My spacing was minimal as it was, so it got even more cramped. Woops. I'll just have to keep them well manured! The cauliflowers are now outside in my nice new cold frame, since I have 22 of the 24 Snowball A up and about half of the All the Year Round. Rain rain rain again. Glad I got the frame up yesterday, though I was hoping I'd have the opportunity to make it a bit more flat to the ground when I got home, as at the moment slugs can get in. Am pondering the wisdom of having the paving stones in it - ok so I have a nice firm surface but then again I can't grow much early stuff inside. But at least there's enough bare soil to try a few webbs lettuces. Especially if I make it mostly slugproof! Don't know if any more caulis will be able to germinate in the temperatures outside, so am now planning on sowing some more All the Year Rounds in a half-tray. They're not supposed to be hardened off until 3rd week of March! Also need to sow modular spring onions. Checked the number of AtYRs when I got home - 17 so far. Total of 39 caulis, so maybe I should just stick with that! Poisonous weather yet again, and frame is still in one piece so that's good. Read a load of old garden mags Dad had found and didn't want any more, and they suggest forgetting netting caulis etc and just covering them with fleece, so they are protected from brassica aphids, butterflies and pigeons. Since I bought the darn stuff to use, this sounds like a good idea until I need the fleece for the early carrots. Also read that a mature row of 10 Glen Ample raspberries will yield 30lbs in a season. Yikes. Now 40-odd leeks up. Embarked on the baby modules and planted 36 each of leek verina and spring onion lisbon. Should be fine, though the major problem will be telling them apart if my labels get mixed up!!! The onions may even grow to full size in these things, though not sure they're quite big enough. But then again, the Musselburgh leeks got to pencil size in them last year… Also popped in another few French beans for forcing as only have half of the planted ones up (and under attack from the aphids on the trailing geraniums). Put them in the same pot, but slightly to the side of the original positions. Murphy's Law struck again - in a nice way. On the way out of work, peered into the skips as usual, and found a couple of box pallets, ie a solid box with runners on. Inch thick wood. So why did I buy an expensive cold frame when there was a virtually complete one for free here? I suppose I have to laugh. Rescued one of them and James grabbed the other. Mine will acquire some perspex for the top and that will get hinged and go and live at the allotment. Probably in the orchard, so I'm not falling over it all the time. Very cold again to start. Went hunting to Homebase and Wickes for acrylic covering for the coldframe. Managed to get a sheet then spent some time trying to get it in place. Problem is it shatters, so ended up attaching some left-over skirting board to it with no-nails (which didn't quite work) and drilling holes through both thicknesses to get the hinges on. Vague success. Narcissi will soon be out (apart from the bought ones which are slightly forced so out already). Planted the sage. Wonder if 30 plants will be enough?!!?? All but two of the leek verina are now up. The spring onions are also now well on the way. Peeked at the residents of the cold frame - caulis seem to be growing bigger leaves and hopefully soon some main ones. Sweet peas definitely need pinching out. Need to get coldframe no. 2 to the allotment.